Hot lava cascading ominously towards a terrified village sounds like a disaster film rather than a relaxing vacation. But we promise you won’t become headline news when you visit our list of scenic volcanoes throughout the world. From the famed Mount Vesuvius in Italy to the lesser-known Nisyros in Greece, you’ll find yourself running towards the beauty of these geological wonders — not dashing away for dear life! Mount Aso: Kyushu, Japan Standing over 5,000 ft. above sea level, Japan’s largest active volcano dominates the picturesque island of Kyushu. Best visited in the warmer summer months, Mount Aso is a roughly 40-minute bus ride from the town of Aso, but, private vehicles have been permitted from driving to within minutes of the crater as of late. Looking to extend your experience? Check out the various campsites at the foot of the summit and horseback riding options at nearby Kusasenrigahama. Mount Etna: Sicily, Italy One of the most active in the world — and the tallest in Europe — this volcano located in the city of Catania fertilizes the soil at its base, which supports the abundant vineyards and orchards across the lower slopes of the mountain. Explore the crater from the Ferrovia Circumetnea (Round-Etna railway) that runs 68 miles in a semi-circle from Catania to Riposto. 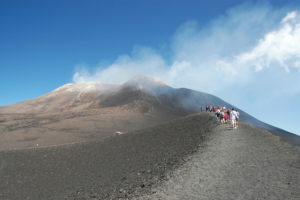 Also, visit in the winter months and hit one of the two ski resorts on Etna! Whakaari: Bay of Plenty, New Zealand You’ll find the active Whakaari — or White Island — in the azure waters of the Bay of Plenty 30 miles from New Zealand’s North Island. Although the island is privately owned and visitors cannot access it without permission, there are authorized tourist trips from nearby Whakatane. You’ll feel like you’re on another planet here as you walk among the steaming and bubbling fumaroles and vibrant beds of yellow and white sulfur crystals. Deep-water fishing is supreme around the island with small charter vessels operating year-round. Mount Vesuvius: Naples, Italy Best known for its eruption in 79 AD, which covered the Ancient Roman cities of Pompeii and Herculaneum in clouds of ash and volcanic gasses, Mount Vesuvius is still regarded as one of the most dangerous volcanoes in the world. Don’t get too nervous, though. Local scientists continually monitor its underground activity. Hike the summit via a network of paths and enjoy panoramic views of Naples below. Fun fact: The iconic Italian song “Funiculì, Funiculà” was written to commemorate the opening of the first funicular up to Vesuvius in 1880. Kilauea: Hawaii Spend some quality time with this shield volcano (meaning it’s large in size with a low profile) by staying at one of the many hotels in the nearby Volcano Village on the Big Island’s south coast. Kilauea is of the few volcanoes in the world that is in a near constant state of eruption but don’t worry it’s slow and steady. 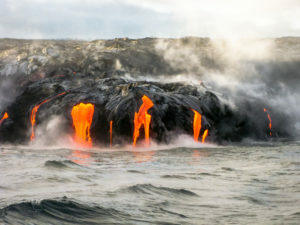 Set out on your own tour of the hiking trails or take advantage of the ranger-guided programs to a Lava Viewing Area in Kalapana on the southeastern side of the National Park. Nisyros: Dodecanese, Greece The least active on our list — its last eruption was in 1888 — the tiny volcanic island offers breathtaking views of the Aegean Sea while the nearly 2 mile-wide caldera boasts fascinating geological elements. Take a ferry from neighboring islands Kos, Piraeus, Tilos and Leros followed by a short, cheap bus ride from the port city of Mandraki to the crater, which feels other-worldly with gasses bubbling up through mud and hot springs.